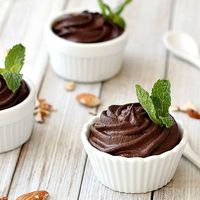 If you’ve never tried avocado chocolate mousse before, this recipe will take you completely by surprise! Made with VTA Smooth Avocado Cream and VTA Chocolate Mousse enriched with FA Almond and FLV Cream and some FA Marshmallow to bind the mix. What you will experience is a soft smooth silky chocolate inhale with a nice crunchy almond touch, on the exhale, heavenly totally delicious, chocoholic vape with the richness of the avocado cream. *Add sweetener to your likings I did not use any. This recipe is the property of sejouced and released under the CC Attribution-Noncommercial 4.0 license. You may not copy, derive or commercialize this recipe without following the terms of this license or the explicit permission of the creator.